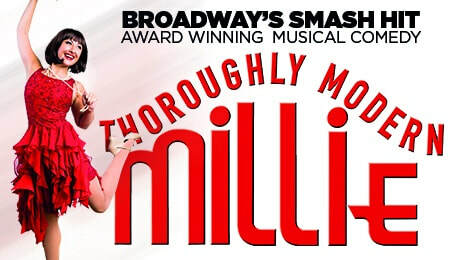 Hayley Tamaddon takes on the title role of Millie Dilmount, a Kansas girl determined to make it big in New York City. Hayley is perhaps best known for her portrayal of Del Dingle in Emmerdale and Andrea Beckett in Coronation Street and for winning the fifth series of ITV1’s Dancing on Ice. Lucas Rush returns as the evil proprietor of the Hotel Priscilla Mrs Meers, a role he made his own during the 2017 tour of Thoroughly Modern Millie. Winner of six Tony Awards including Best Musical, Thoroughly Modern Millie is based on the 1967 Academy Award-winning film. Taking you back to the height of the Jazz Age in 1920s New York City, when ‘moderns’ including a flapper named Millie Dillmount, were bobbing their hair, raising their hemlines, entering the workforce and rewriting the rules of love. From explosive tap numbers to a ‘Fred and Ginger’ dance routine on a window ledge, and featuring hit songs including Gimme Gimme and Not for the Life of Me, Thoroughly Modern Millie is a brilliantly funny and entertaining show for all the family.